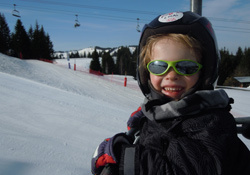 When we signed Lucas up for Club Piou Piou (ESF ski school for 3-year olds) for nearly 2 weeks, we never dared think that by the end of it he might actually be skiing. 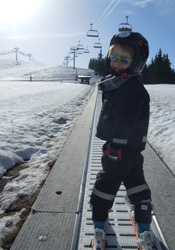 What with those little legs, the little slope and a play time in the middle of the 2 hours session, we figured that he would become happy with fooling around on skis… but to actually ski? No way! But after just the first week he went up to “Ourson” (for 4-year olds) and started on the magic carpet at the top of the red bubble. 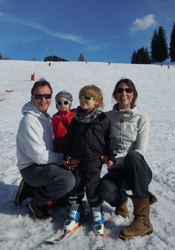 And on his last couple of days we took him up the Chavannes 6-man lift, and skied the top half of the blue with him. Of all the amazing powder days and perfect pistes of a life-time of skiing, this has been my favourite ever run. A proud parent indeed. We just need to get Samuel sorted now, though I think we’ll need to wait a little longer! ESF did a brilliant job – they made it really fun for the children and let them take it at their own pace. They were encouraging and friendly, and Lucas really looked forward to going there. The badge that he received at the end was a real bonus. Lucas has it pinned proudly to his new school bag.